up our winter dry skin....smells divine! Winter definitely has its drying effect on our skin. 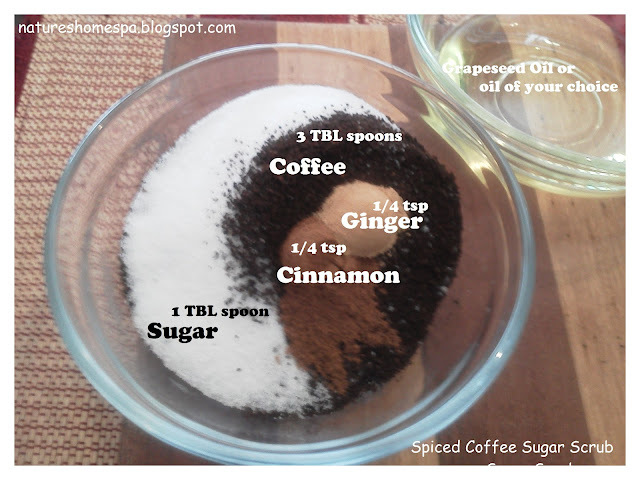 How about a yummy, toasty coffee sugar scrub scented with the warm essence of ginger and cinnamon! Ginger, a native plant of Asia, does have some skin benefits. As a natural antioxidant it fights skin damaging free radicals, and is said to promote an eveness to skin tone and lighten age spots. Which is why I intend on using this scrub on my hands. It is also used in cellulite reducing formulas because it improves circulation, which is why I coupled it with coffee as a scrub to use on legs! Once you do a nice sugar scrub on your skin, and the old dry skin sloughs off, your oil can get down in there where it needs to be, leaving your skin feeling soft, supple and moisturized. Just what you need to fight the winter dry blues! This recipe makes about enough for one full body use. Use spices and Oil at your own rate to truly make this your special scrub! (Keeping in mind that too much cinnamon is drying) Some like their scrubs liquid, some like it dryer. I make mine with 2 TBL grapeseed oil in this recipe as I prefer a lighter oil. You can use olive oil for a heavier scrub or mix the oils, or melted coconut oil, sweet almond oil,......your choice! 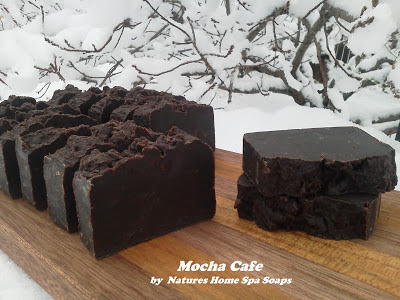 A soap made with fresh brewed coffee and real cocoa powder. 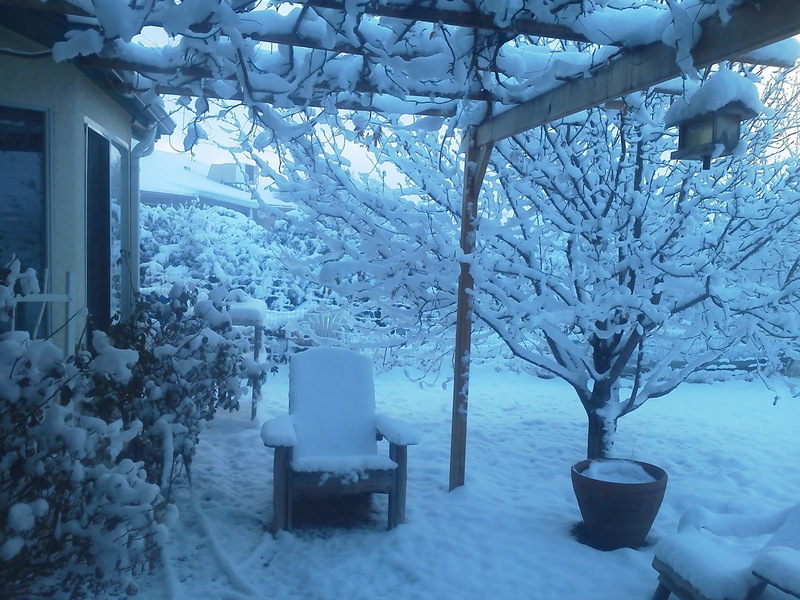 My back yard.......It snowed here last night in Arizona! What a wonderful accompaniment to your Mocha Cafe soap, yum! It's fun to see how you were inspired by your new soap and took it another step further with a delicious sugar scrub. Thanks for the info on ginger being beneficial for age spots, I have a couple of those I'd like to chase away. Jan, Happy New Year to you and yours! I thought you might like to see the snow fall we had last night, so I posted a couple pictures above with the Mocha Soap for you.... my fellow Arizonan Soaper! Hi Anna, I can smell the coffee almost many, soooo delicious. Your soap has become really good. So beautiful dunkel.Und nice also, the foam is so beautiful remains white. Did you do really great. Oh yes you have a lot of snow. Great pictures. There are unfortunately no snow. Not even a little. Hi Doreen, thanks for stopping by my blog. Yes, this coffee scrub smells great, I think next time I make it I will add more ginger, and maybe a little olive oil to the mix! The last time I was in your area it snowed, it was a fun crazy time coming up the mountain that day. That's a great question! I've thought of trying Orange Essential Oil so why not try Lemongrass EO if you have it? Healthy Body: Hi. Just came back from checking out the 30 Day Health Challenge at bodymindhealth.wordpress.com and it looks like a really fun and doable (is that a word?) challenge, that will be totally rewarding. I think I will try it too! Do you mind if I put a link on my blog to it?